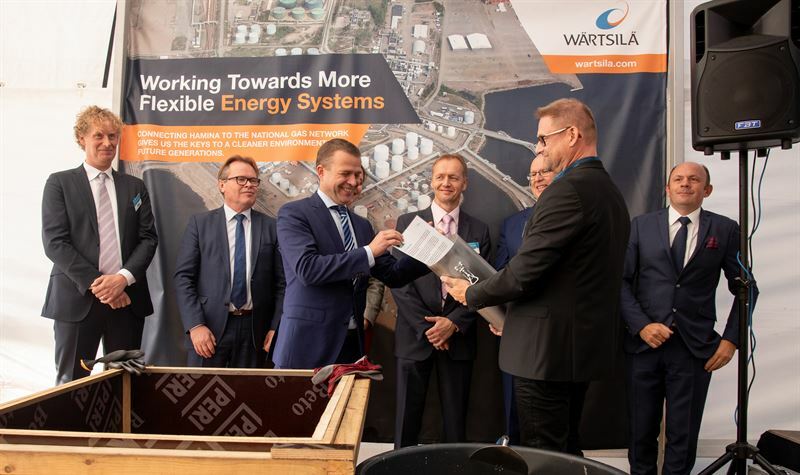 A ground-breaking ceremony for the new Hamina LNG terminal that is to be engineered, procured and constructed by Wärtsilä was held on September 25. The ceremony was attended by Finland’s Minister of Finance Mr Petteri Orpo, as well as local officials and executives from Hamina LNG Oy and Wärtsilä. The 30,000 m3 capacity terminal will provide storage of liquefied natural gas (LNG). It will also have re-gasification capability for sending the gas to the existing distribution network serving both regional and national markets. In addition, the terminal will have a truck-loading area for LNG, as well as the possibility to supply bunkering barges and small-scale carriers. The tank foundation for the terminal has already been cast, and the facility is scheduled to become fully operational in 2020. This project is part of the global expansion of the LNG infrastructure market. Wärtsilä continues to play a valuable role in this development through its deep understanding and knowledge of the LNG value chain, and its extensive offering in LNG related solutions. “This new terminal represents an important addition to Finland’s gas infrastructure and will support our ambition to provide a reliable supply of clean energy to local industry and businesses. We appreciate Wärtsilä’s extensive capabilities in LNG engineering, which have made this project possible,” said Markku Tommiska, CEO, Hamina Energy Ltd.
Wärtsilä Development and Financial Services (WDFS) has a minority investment in Hamina LNG Oy, the main shareholders of whom are Hamina Energy Ltd and Estonian energy company Alexela. Preparations are being made for a second 20,000 m3 LNG storage tank to be added in the terminal at a later date.